Deer turns the tables on his hunter! 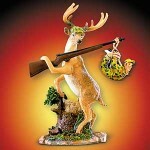 Avid outdoorsmen will get a kick out of this triumphant, camouflage cap-wearing buck who proudly displays his trophy on the end of a rifle. Or not.